Please note: The information about the Warren Ancestors has been retrieved from an Ancestral File on FamilySearch.org, which I have not personally verified. 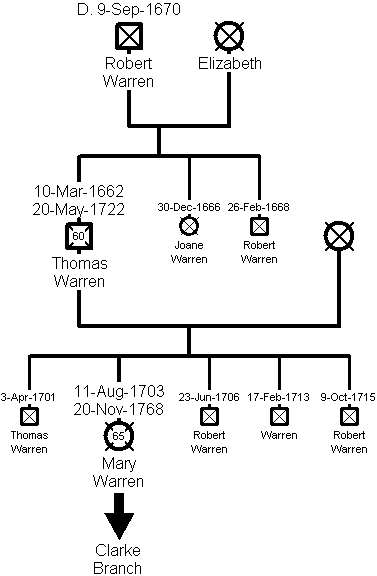 The earliest known Warren ancestor is Robert Warren. He was born circa 1635. He and his wife Elizabeth had three children, who were all baptised in Culmstock, Devon. The eldest, Thomas, was baptised on 10 March 1662. Robert was buried on 9 September 1670. Thomas Warren was baptised on 10 March 1662 in Culmstock, Devon. He had five children who were all baptised in Culmstock. The eldest, Mary, was baptised on 11 August 1703. Thomas was buried on 20 May 1722. Mary Warren was baptised on 11 August 1703 in Culmstock, Devon. She married Richard Clarke in Cotleigh, Devon on 12 January 1729. They had six children. Mary was buried on 20 November 1768.